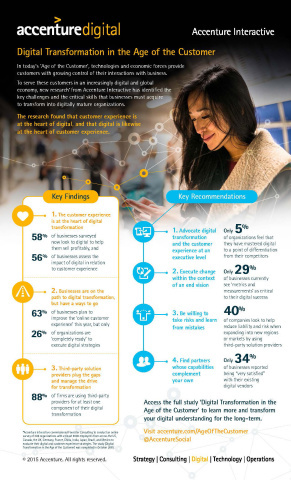 through the digital customer experience they offer. percent) and “improving differentiation” (16 percent). at 17 percent and eight percent, respectively. technology (75 percent) and operational processes (75 percent). establishing digital metrics and measurements are. believe they meet those expectations. be confined to a single department. with providers on enhancing the customer experience. inhibitors to achieving superior customer experience,” said Roytman. AM ET/16:00 PM GMT/17:00 PM CET and register here: http://webcast.accenture.com?event=digital-transformation.